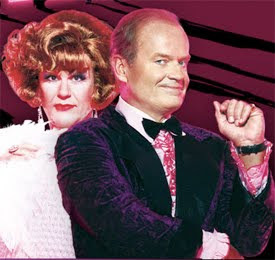 Bid Kelsey Grammer and Douglas Hodge adieu as the leading pair exit stage right from the Longacre Theatre production of La Cage aux Folles. Winner of the 2010 Tony for Best Revival of a Musical, La Cage aux Folles tells the story of a nightclub owner, his lover and their son who must gracefully host a dinner party for the son’s fiancé and her conservative family. The audience can even interact with the drag show and catch the family’s escapades from bistro tables that have replaced the first few rows of orchestra seating. But the show goes on! After Grammer and Hodge depart, the production welcomes noted actor and playwright Harvey Fierstein and Jeffrey Tambor (Arrested Development) as the leading (wo)men.